Frontier Developments announced today that the next Jurassic World Evolution update is coming out on September 13, 2018. This update brings the game to version 1.4, and it’s a big one. 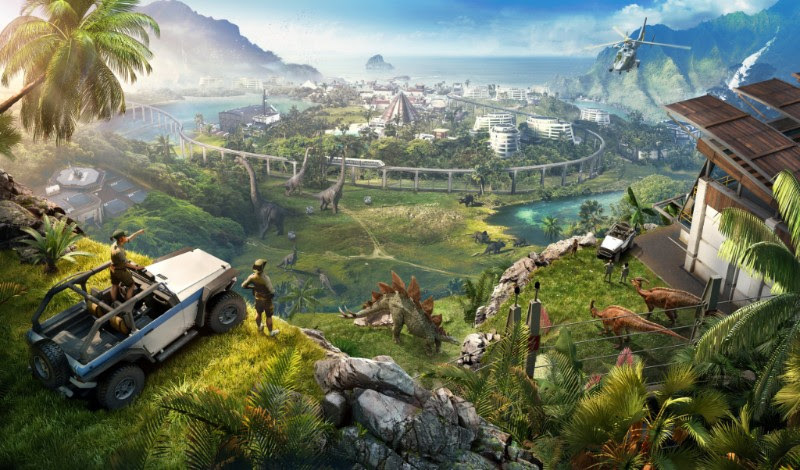 Coming to Jurassic World Evolution are a new Challenge Mode, more content for the sandbox, more lighting choices, new contracts, new cameras, and plenty more. A new feature greatly requested within the community is Challenge Mode (separate from Story Mode). You’ll find yourself with very little starting money as you progress through Isla Nublar, with difficulty levels that you can adjust before you start (easy, medium, hard and Jurassic). We’re also adding some new mechanics like Hammond Foundation fees, contract cancellation penalties, and personal best completion times. You can unlock new skins (and achievements/trophies!) when you complete Challenge Mode for the first time and also when you beat the ultimate challenge, Jurassic difficulty! Good luck! Isla Nublar is our dedicated sandbox island, and we’re adding more options so you can play the way you want to; you can toggle these settings in the Options Menu at any time. A few exciting additions are the lifespan toggle (dinosaurs no longer die of old age), cash level toggle (decide how much cash is available to you), various difficulty settings (dinosaur variety, rating, guest count, and economics), feeder resupply toggle (no more pesky ranger jobs! ), and power toggle (no power stations or power requirements needed, as well as no power outages). Once you have achieved 5 stars on each island in Career Mode, you’ll unlock different lighting options: default, dawn, dusk, and night. You can now revisit your islands and choose which setting you want to play in, which should give you some nice new challenges and more opportunities for gorgeous photographs. We’re adding some more variety of contracts for all Divisions, which will have you working to improve guest coverage, increase dinosaur visibility and rating, and achieve higher levels of profit for your island. Make sure you’re up to the task before accepting them! We’re adding new camera features to the viewing gallery and viewing platform so you can watch your enclosures from your guests’ perspectives, as well as a first-person camera to the monorail train – positioned at a height above the train that will go over stations. We’re happy to be bringing both Korean and Italian Voice Overs and subtitles to the game, so players from those regions can enjoy the game with their native language. Welcome to the community! Other than what’s above, we’re also adding several new things based on your feedback such as a camera zoom toggle, the option to cancel a research project or incubation, the option to revert all the genes to default, new dinosaur bio information in the Genome Library (health and comfort requirements), shortcuts to research items from the Upgrade and Build menus, and more general fixes and tweaks to the game. We will post the full list of fixes on September 13 with the 1.4 Release Notes for you to go through at your leisure.